What is a goal type? Goals are highly flexible. They allow you to capture a huge range of activities, targets, outcomes etc. in a simple, consistent framework. This flexibility means that you'll want to be able to label your Goals with different tags, to help you view and report on the different types of objective you have created. Goal Types are these tags. You can set up the Goal Types to be mandatory or optional, and multiple or single-option selection, to support different business needs. So whether you want to apply a formal classification such as a balanced scorecard, an organisational category specific to your business or industry (e.g. a line of business or product area), or a more general breakdown such as geography (e.g. national or world regions, countries, states), Goal Types give you that flexibility. 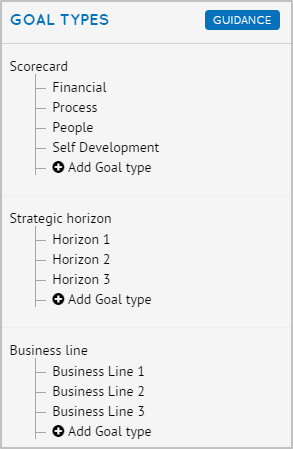 While Cascade provides great flexibility for you to create your own tags to classify and categorise your Goals, and you can also use any of our pre-populated examples.